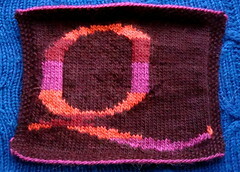 I am creating an abecedarium of knitted letters. An abecedarium is an alphabet that celebrates the letter’s typographic design and the word that represents it. In the most familiar example, “A is for apple,” the form and shape of the A are as important as the illustrated apple that represents the letter. Also available to Ravelry members via Free Ravelry download. 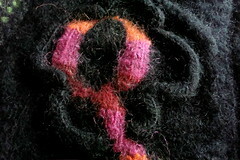 This is a Flickr badge showing photos in a set called Knitting. Make your own badge here. Unless otherwise noted, all images and photographs that appear here are by the author of this blog and should only be used elsewhere with permission. Most of the digital images can be found on unionpearl’s flickr account, or enlarged by clicking on the pictures as they appear in the blog. Permission can be obtained by e-mailing unionpearl[at]gmail[dot]com. Not trefoil, not cinquefoil, but quatrefoil, the architectural equivalent of a four-leaf clover. I want to thank Dee D and Carrie K for this most excellent thematic suggestion. In English, the letter Q rarely appears alone, but the OED has of course tracked down innumerable instances, one of which I find oddly compelling: “Q in the corner. . . a person who or thing which sits in the corner, one who is unnoticed or unimportant; also as a (self-mocking or self-effacing) pseudonym.” Perhaps Q’s queue is always off getting into other people’s business, leaving him to hide in the corner? 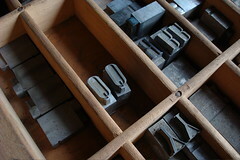 The letterpress landscape is littered with Qs: quad (short for quadrat), quoin, quarto, quire, question & quotation marks, even quadrata (Roman inscriptional capitals, of which I am particularly fond). With such a rich field of possibilities, it was difficult to settle on just one, but the quatrefoil is so delectable! Yes, of course I did consider qiviut, (an Inuit term for the wool of the musk ox), and almost indulged in a $60 skein of it, but the economy isn’t quite supporting that kind of research just now (at least not for me). I am struck by the preponderance of Latin roots for many English q-words that emanate from quad (4), or at least to the concept of dividing into four parts: quatrefoil (in French, quatre–4– and feuille, leaf), quadrille (a card game or square dance...or graph paper), quadrilateral . . . Whether it’s four sides, four parts, or foursome, “quad” words imply a kind of separation just as much as they convey principles of symmetry, mirroring and equality. In other words, they allude to the whole as much as to its four equal parts. 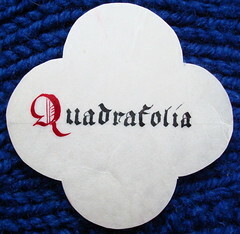 The quatrefoil is an excellent example of a whole (in this case, a circle), precisely and geometrically sub-divided and re-combined into a new, four-part shape. Take a look at SkillsTech Australia’s presentation, Guide to Drawing a Quatrefoil, and learn how to use simple geometry to create a perfect quatrefoil (then carve it in stone!). I tend to associate quatrefoils with architecture, and certainly that is their best-known application, but they do also appear in other forms of ornamentation, including in manuscripts. Despite manuscript possibilities, the architectural quatrefoil is what appeals more to my tactile sensibilities. A form of tracery, the stone quatrefoil is not quite free-standing, but usually exists as thin, stone outlines, leading the eye from one zone to the next. 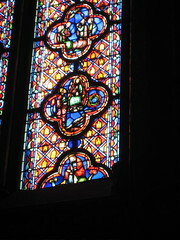 Often, quatrefoils enclose stained glass, but the four-leaved plant motif can also appear as part of the stained glass itself. The preference in Gothic architecture for quatrefoils has produced a legacy of four-leaved ornaments that enriches architecture of the Late Middle Ages. 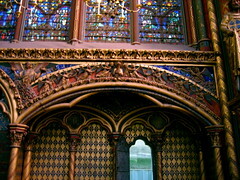 In Paris, for instance, the gem-like Sainte Chapelle (late 13th century) showcases some of the world’s most celebrated stained glass, much of it outlined by quatrefoils. A few steps away from Sainte Chapelle is the less ethereal, but oh-so-storied Notre Dame de Paris Cathedral, an earlier, much more massive structure. 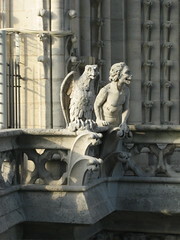 On its tower (right), alongside human-sized grotesques in the galerie des chimères, Viollet-le-Duc built a retaining wall of open quatrefoils in the mid-nineteenth century. He meant them to look medieval, and has fooled generations of tourists ever since (including Disney, apparently) into thinking them ancient. 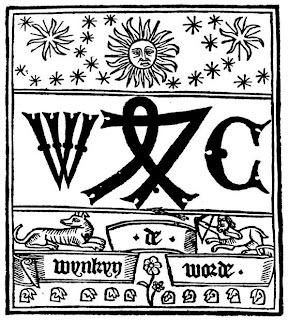 Wynkyn de Worde’s “Sagittarius” Printing Device. Reprinted in Henry Plomer. A Short History of English Printing, 1476-1898. London, 1900. Wynkyn de Worde, one of my most favorite early printers (and I’ll freely admit it’s mostly because of his beguiling name), printed a poem in a small volume entitled Four Leaves of the Truelove (The .iiii. Leues of the Trueloue) in 1510. It was a piece of religious allegory, sometimes also called the The Quatrefoil of Love. Although there is some debate about the poem’s merits and message, most scholars agree that the central emblem—the quatrefoil, or four-leaved plant—refers literally to Paris quadrifolia (true lover’s knot), a woodland plant that still exists in Europe. 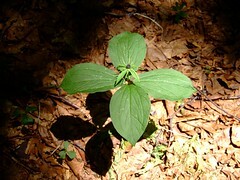 A relative of the trillium, it has four equally-sized leaves emanating from a single stem, and one lone, toxic berry. Perhaps the nickname refers to the berry’s seeds, which are (in small doses, one hopes) occasionally used as an aphrodisiac. The poem gives us some insight into why the quatrefoil was such an enduring motif in medieval architecture. True Love (Paris quadrifolia). 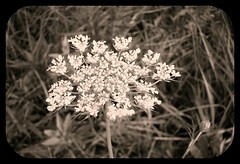 Taken June 2008. Source: Flickr. All rights reserved. Used with permission. Naturally shaped like a cross, the plant’s form was useful for explaining Christian virtues, and a perfect vehicle for allegory. 4 gospels, 4 apostles, 4 sides of the cross: Christian iconography was (and is) rife with foursomes. In medieval European philosophical discourse, we also find much pondering of the 4 humors, 4 winds, 4 cardinal directions. So a sort of rule of four was at work. As much a logical division as a logical combination, the symbolic quatrefoil appealed to medieval stonecarvers and poets alike. I was delighted to learn that there are at least two quatrefoil motifs in knitting: the quatrefoil eyelet and the Walker quatrefoil cable. Since I’m looking at the quatrefoil’s architectural aspect, I took the cable as my inspiration. I wanted to produce a knitted tracery enclosure for a sort of stained glass-like motif in the quinacridone-like colors (thank you, Denise!) of Brown Sheep’s Lamb’s Pride. My plan was that the cables would provide structure and boundaries, while the intarsia & stranded colors would pop out from the black background. I couldn’t quite get the cables to do my bidding, so I resorted to an applied I-cord, twisting around the central Q. It looked like a cartoon, so I just accepted its whimsy (after all, quatrefoils are good enough for Disney), but quickly decided it could be improved through some transformative felting. As I write this post, my “architectural” quadrilateral is jostling its way around the washing machine, altering itself into a small, felted monument. The finished pictures won’t, I hope, reveal the tinge of regret I’m experiencing. But really, I can’t pretend that I have any real plan for this particular piece, except as a page of my abecedarium. 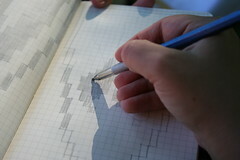 This A-to-Z project is now morphing from a largely digital excursion into a real, knitted book. I haven’t quite figured out how I’m going to bind it all together (possibly with dpn knitting needles or perhaps simply sew it together, accordion-style), but at this point I have quite a few “pages” that I want to compile into codex form. The Q has now emerged from its aquatic journey, smaller and fuzzier, but intact and perky—not exactly projecting architectural gravitas, but a happy caricature. Betty Monroe’s Center Motif Pullover (Vogue Knitting Anniversary Issue, Fall 2007). Ravelry info (for members only) and Vogue’s errata page. Quatrefoil Shrug by Janine Le Cras (Unique Sheep), featuring the quatrefoil eyelet. Koolhaas, by Jared Flood (Interweave Knits, Winter 2007). A wonder of spiralling, medieval-esque, cabled tracery, although the designer suggests this hat was inspired by the architectural designs of Rem Koolhaas. 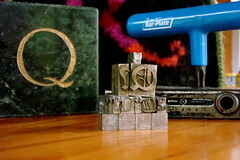 Two-part post on the quatrefoil from Sarah Jennings in her blog, Things that Inspire. Owen Jones. Grammar of Ornament. “Medieval Ornament No. 4: Encaustic Tiles of Various Periods.” 1856. Plate LXX (Lithograph). And, you got it: the 4-H is really a quatrefoil! Kate Hillard, “A Quatrefoil” The Galaxy. Vol. 19, Issue 2 (February 1875): 244-245. The remains of St. Cuthbert of Lindisfarne (ca. 634– 687) came to rest in Durham, where a great cathedral was built in his honor. His tomb survived the Reformation, but was unearthed in 1827, when remnants of vestments (dated between 909 and 916, probably made in Winchester, England) were found in it. They are widely considered to be the most famous examples of Anglo-Saxon textiles that survive. Both the stole and maniple feature central quatrefoil motifs embroidered in gold thread and remarkably, red silk, in a Byzantine style (concrete proof of Silk Road trade). Grivell’s design for a three-piece tea set with quatrefoil ornaments (Wedgewood), ca. 1789. What a good looking Q and, love the colors! Haven't had a chance to read all your reference material but will do so, eventually. Machine felting can be very scary. It is so wonderfully 3-D. Yours is the very best blogging has to offer! As usual, an absolute delight! 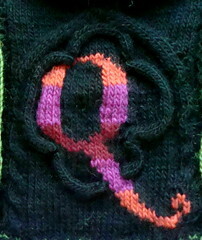 I love the Q in the corner of your quatrefoil. Coincidentally, I just posted my own quatrefoil on TwinSet yesterday - a shot of Cornus canadensis in all it's autumn glory. If you are curious, it is in the October 4th post. Always illuminating and I love your entertwined Q and quatrefoil cable. Wynkyn de Worde? The things I learn on your posts. I realize your abecedarium can only be one of a kind but it would be a lovely book. I love your blog so much! What a mine of information, quite apart from the fabulous photos of your knitting project. Fabulous. Oh, so that's what that shape is called. Very very cool post, you're threatening to expand my brain and make me think again. I love the bright Q on the dark background. What about an accordion fold book? You might be able to put it together in a way that it could be hung like a banner if you chose.